This was one of those magical shoots where every photo had me saying "omg". 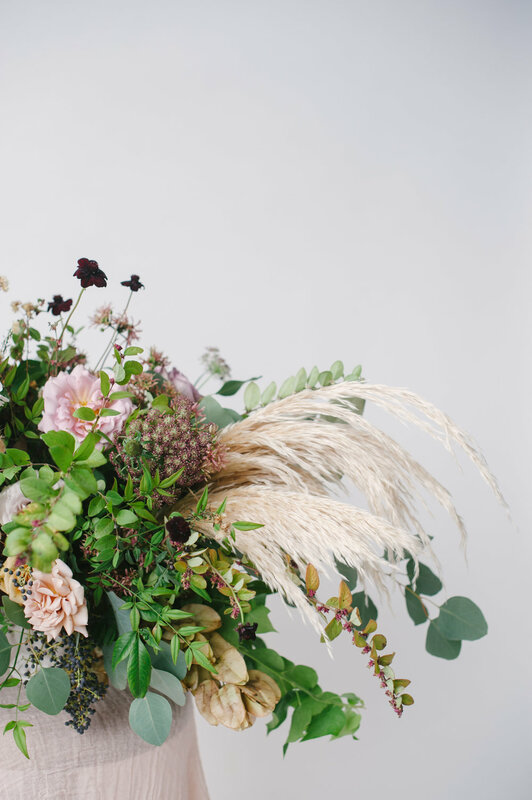 This wild woodland bouquet includes blush quicksand roses, astilbe, white anenomies, veronica, and a variety of greenery including eucalyptus, bladed acacia, and sword fern. Personally, I love to design bouquets using a variety of greens. It adds color, texture, and shape to the design. Foraging for greenery is a great way to add some uniqueness too! Pismo Dunes Shoot with Michelle Roller Photography. Not gonna lie, it was a bit windy this day out on the Pismo Dunes, but overall it made for fantastic Photos. I was kinda fan-girling when Michelle Roller asked me to be part of this shoot, because she is amazing and pretty and so incredibly talented. The endless rolling dunes and shadows cast by the sun made for an other-worldly landscape. Custom made backdrop by Dark Marquee Designs, rentals by Avenue Twelve, and coordination/design by Sand Castle Celebrations. Also swooning over this dress from Moondance Bridal, and Hair & Makeup by The Queen's Bees and Megan Navongsy. 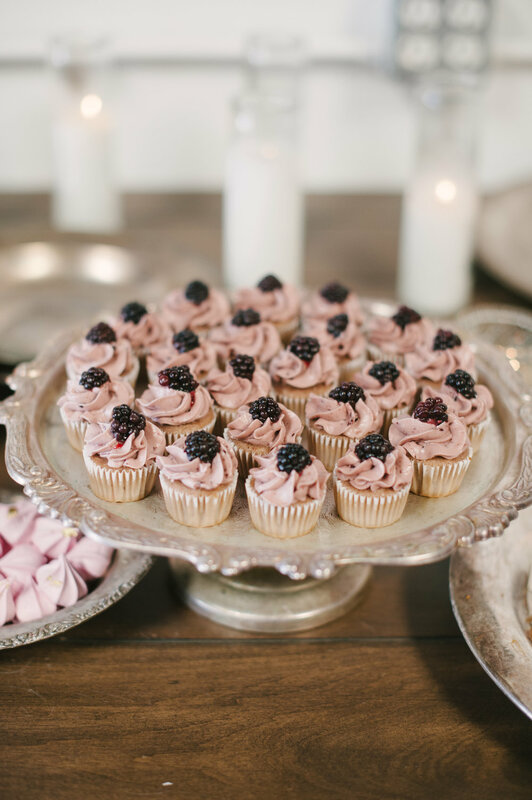 Wear Your Love styled shoot with Heidi Toeves Photography. I took a break from blogging, but I'm back at it! Here are some gorgeous scenes from a shoot we did a while back with Heidi Toeves for Wear Your Love. 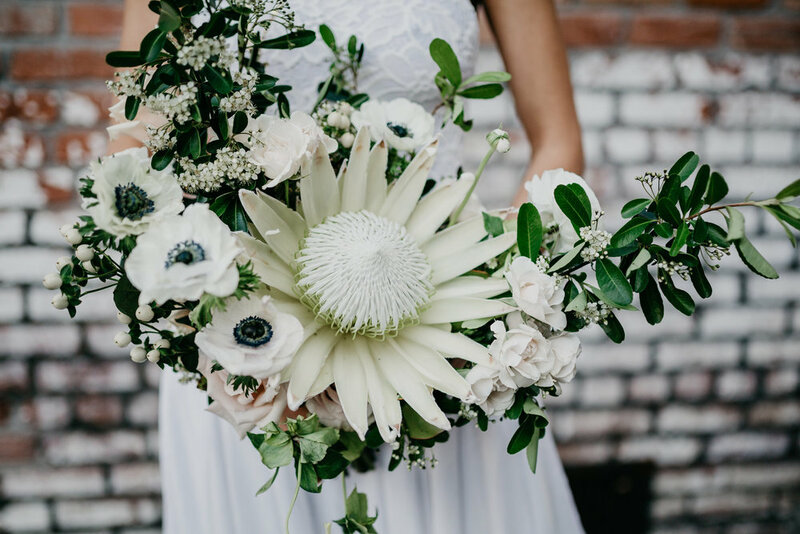 This bouquet contains quicksand roses, majolika sprays, white hypericum, anenomies, and king protea. The greenery was foraged from around my neighborhood. I love to pair quality blooms with wild and free foraged greenery for uniqueness. When you get an opportunity to work with an amazing team of creatives you do not hesitate to say yes. Especially if the shoot is at the historic Old Mission San Miguel Arcångel. There is just something about red tiled roofs, white walls, and exposed brick that makes my heart swoon. Eucalyptus Garlands are trending hard at the moment so it was fun to get creative with it and make a wearable one! Paired with the gorgeously detailed dresses from Moondance Bridal, it added a special touch to this already gorgeous setting. February - one of the leanest months for foraging and growing flowers, lends itself quite well to the cold and wet conditions necessary for growing Narcissus bulbs. These beauties, so fleeting in nature, come up in our yard around this time for only a few short weeks, and then they are gone - until the next year. They are so fragrant that I can only bring in a few stems at a time, as they take over our entire home with their scent. The Narcissus is a genus belonging to the Amaryllis family - which actually makes since now that I think about it, given their general shape and texture. The Narcissus arose from the Iberian peninsula and adjacent regions of Southwest Europe. The origin of the name Narcissus is unknown, but is linked to the term "Narcotic" the Greek word for intoxicated. Narcissi are long lasting bulbs that propagate by division - they are also insect-pollinated. Like other members of their family, these flowers produce a number of different alkaloids, which provide protection to the plant - but may be poisonous if ingested. Here are some photos of the Narcissus I cultivated from my garden. A few weeks ago I had the amazing opportunity to go to Southern California for The Romantik Fall Centerpiece Workshop. It was hosted by two of my favorite flower ladies - Rachael of Lace & Likes and Siren Floral Co. and Kasia of Plenty of Petals. It was a day of unforgettable treats and floral tricks, and inspiration everywhere. 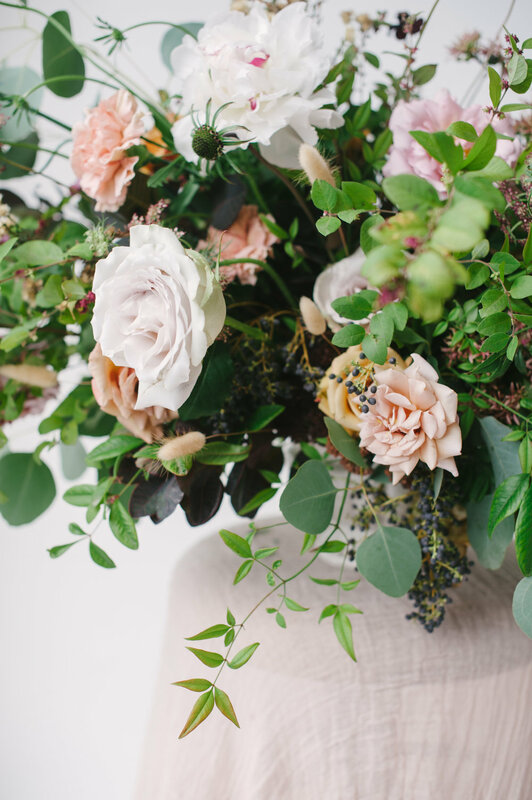 I met some amazing women who are passionate about their floral design work, which fills my heart up so much. When describing my experience to a friend, the best I could do was say: “It was seriously so magical and inspiring, and there was a dog too!” Cash the buddy was so sweet and followed Rachael around the entire day – heart melt. 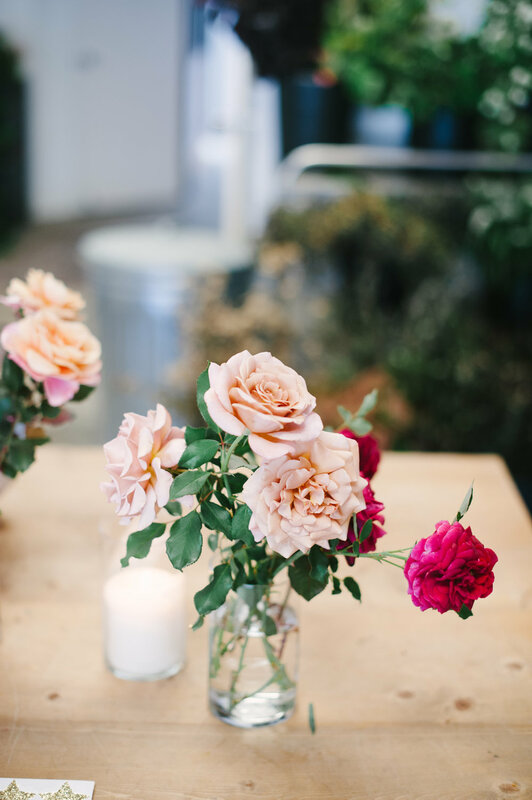 Here are some photos of my day at the workshop - and if you ever have the chance to sign up for a Romantik Workshop I highly encourage you to. There is always always always something new to learn and grow into – no matter how seasoned you are. We talked about color transition and theory, depth and texture, taking risks, setting boundaries, “inny outtys”, big fatty flowers coming out at your face, everything. I heard exactly what I needed to hear, and it motivated me push my own boundaries and try something new and different and scary in my creative work. These are the reasons why I ultimately entered into this field - to take risks and face challenges and put myself out there even when I have doubts. And from experience, things always work out better than expected. I love travel. I like road tripping or taking the train, but I love flying the most. I just really like airports. I have WAY too many books. Like, stacks and stacks. Sometimes I just go to the book store to see what I can add to my "collection", not because I need a new book to read. I collect vintage Botanical reference books and encyclopedias, and apothecary bottles. I am fascinated by early science. I studied History at UC Berkeley. I fell in love with research and libraries there. I married my best friend and biggest fan. He loves plants and flowers just as much as I do. I like to support our local farmers. My favorite thing to do with my free time is peruse thrift shops for unique flower vases. I have a small cutting garden, which one day I hope will magically turn into a working flower farm. I have been a florist for over 12 years and counting. When I was 16, my first job was assisting and making hand bouquets for a bucket stand just steps away from my house. I grew up in San Clemente, Ca., and my family still lives there. I am definitely a beach baby. I LOVE CHIHUAHUAS. So much. My daily affirmation is "Commitment is of Interest to the Great Creator." by Julia Cameron, my favorite author. Well that's enough about me. I am excited to share more of my personal and floral musings with you. Tiana Ross is the owner and lead designer of Aurelia Flora. She is currently working out of The Wedding Space in San Luis Obispo, a collaborative studio. She draws inpiration from her natural surroundings and has a passion for wildly untamed beauty.